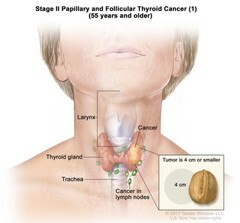 Stage II papillary and follicular thyroid cancer (1) in patients 55 years and older; drawing shows cancer in the thyroid gland and nearby lymph nodes. The tumor is 4 centimeters or smaller. An inset shows 4 centimeters is about the size of a walnut. Also shown are the larynx and trachea.